Stunning location and dramatic design come together in this unique oceanfront property. Lighthouse Point, with its distinctive lighthouse feature, was designed and built with attention to detail. Four bedrooms, gourmet kitchen, great room with soaring cathedral ceiling and massive Blue Hill granite fireplace. The lighthouse tower, with its 360-degree views of the ocean, islands and Camden Hills beyond, is truly unique. 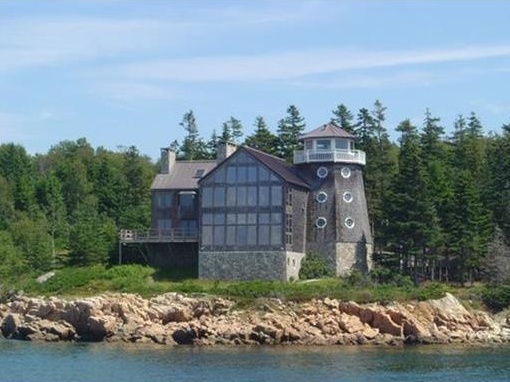 85 Buck and Doe Drive (MLS #1304952) is a contemporary, shingle style single family home located in Deer Isle, ME. This single family home is 5,859 sqft and on a lot of 226,512 sqft (or 5.20 acres) with 3 bedrooms, 5 baths and is 29 years old. This property was listed on 12/07/2018 and has been priced for sale at $1,550,000. Nearby zip codes are 04676 and 04681. This property neighbors other cities such as Sedgwick and Stonington. Listing Last updated 04/02/2019 11:00 AM CDT . Some properties which appear for sale on this web site may subsequently have sold or may no longer be available. Walk Score provided by Walk Score. Mapping data provided by Google and Bing.